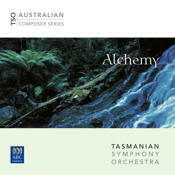 The Australian Music Series is a new set of recrodings by the Tasmanian Symphony Orchestra which will present the music of Australia’s finest composers in the most ambitious Australian music recording project ever undertaken by an Australian orchestra. The first releases in the series will include the music of Ross Edwards, Peter Sculthorpe, Carl Vine, Nigel Westlake and many more. The Alchemy collection, released in February 2004, is a preview of some of the musical highlights that will be contained in the complete collection. For more information on this CD visit the TSO website.